Coaches generally agree that athletes’ perceptions of authority have changed in past decades. Years ago, the coach was viewed as an authoritarian figure much like a military leader. The modern athlete seems averse to this style of coaching. Generation Z athletes desire much less direction from coaches and demonstrate an independence apart from adult input. Perceptions of authority differ from years past, when the coach operated in more coercive manner. Faced with these changing perceptions, how does the coach retain his or her influence and relevance? Do coaches need to compromise their core beliefs to be effective in our present world? In an effort to answer these compelling questions, I undertook a study to gauge the effectiveness of servant-leadership coaching on the motivational level of high school athletes and designed to determine what coaching traits served to best motivate athletes. This study determined a causal link between servant-leadership behaviors and increased player motivation. In this modern sport climate, the concept of servant-leader coaching remains a relevant model for the contemporary coach. Evidence from a research study conducted by Jon Hammermeister supports the notion that ethical core values have a significant positive effect on player motivation. Hammermeister has authored one of only two studies to date that have investigated servant-leadership in sports. His research has indicated that coaching behaviors can have a significant impact upon the motivational levels of players. Coaches still possess unique standing in our society and are widely viewed with respect. During these changing times, it’s important that coaches retain this ethical sense of leading the young people of our nation. 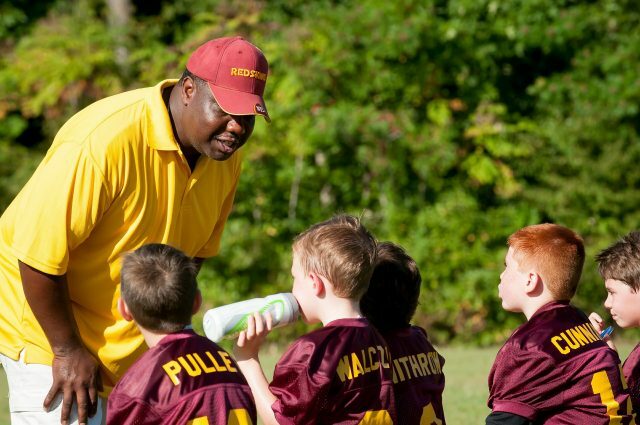 Coaches are positive influences in society when their leadership style is based on core values. Results of my study indicated the coaching trait that provides the greatest motivational value is trust (35 percent), followed by compassionate love (16 percent), in addition to empowering and vision (15%). My conclusion from this study is that young people are motivated by coaches who they trust, who demonstrate affection toward them, and who see their worth and seek to develop them. It comes as no surprise that trust and love remain timeless virtues in the modern world. It is an affirmation of servant-leadership to discover how research confirms that authentic core values are cross-generational constructs that remain relevant motivators for coaching the modern athlete. Servant-leadership coaching in the modern sport culture of America remains a viable and compelling style that is proven as an effective tool to motivate athletes. Research indicates that trust is the result of three specific traits — expertise, affection and integrity. Similar research supports this predisposition to trust that leads to positive work attitudes. I conclude that the secret to motivating athletes is the establishment of a trust relationship. It’s all about trust! Marty Durden, Ed.D., is the director of athletics at Presbyterian School in Houston, Texas. He earned his Doctor of Education degree in sports management from the United States Sports Academy. He serves as an adjunct instructor at Concordia University in Austin, Texas, and Belhaven University in Jackson, Miss.